During periods of heavy rain, it is very common that water will find its way into your basement, either through your foundation or floor, but very often through a casement window. These window are often at ground level, and if the ground is already saturated with water, it is very easy for it to come in through a window. Ceiling Tiles Don't Like Water! Drop ceiling tiles, popular in basements, are usually a main casualty of water damage. Made from a combination of naturally occurring, processed and recycled materials, they are unfortunately NOT water friendly. Just a small amount of water will stain tiles, but in the case of a water disaster they will sag, crumble, or completely disintegrate, leaving a soggy mess. 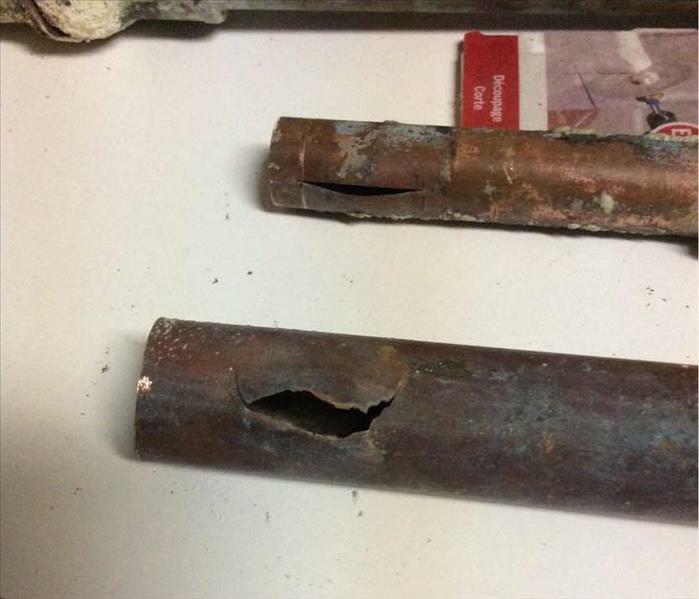 Broken pipes are no fun, and even the smallest hole can devastate a home with gallons of water. The amount of water damage can be staggering. When you call SERVPRO of Hackensack/Little Ferry you know you will have certified, professional, and knowledgeable technicians extract the water and dry your home, leaving it clean and dry, just "Like it never even happened." 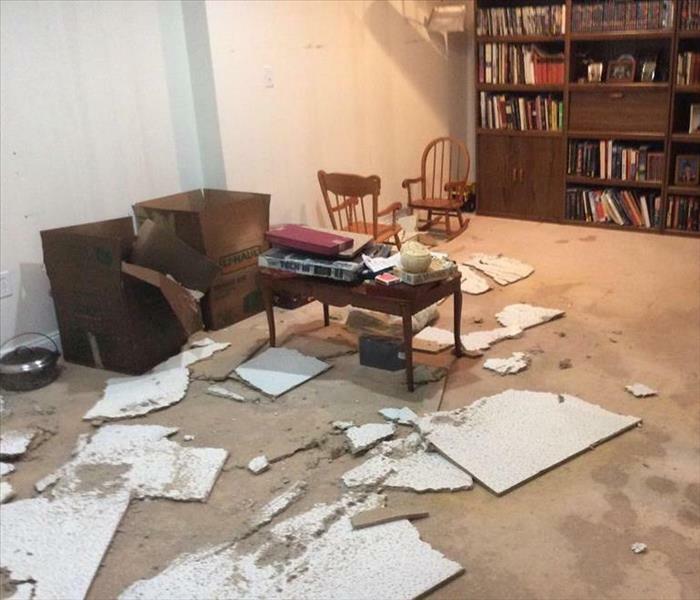 Water damage can happen anywhere, not just single family homes. 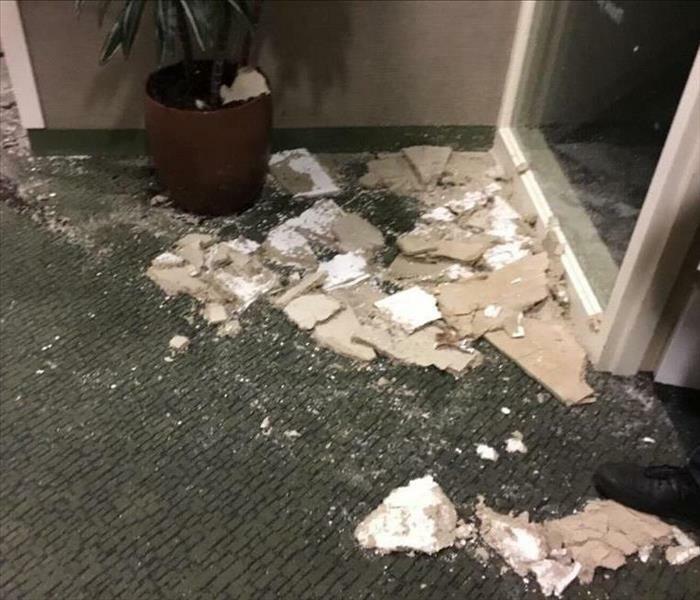 Commercial properties such as condominiums can also be affected, and since water travels the pathway of least resistance, can create damage on several floors. 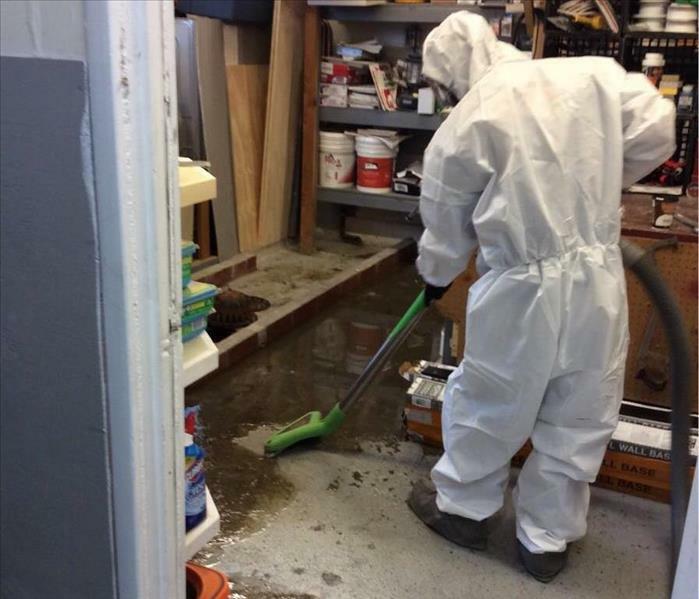 Knowing how to clean and restore water damage, no matter where it happens is SERVPRO's specialty! If you discover mold in any room in your home, chances are that there will be mold in other rooms and most likely behind the sheet rock. 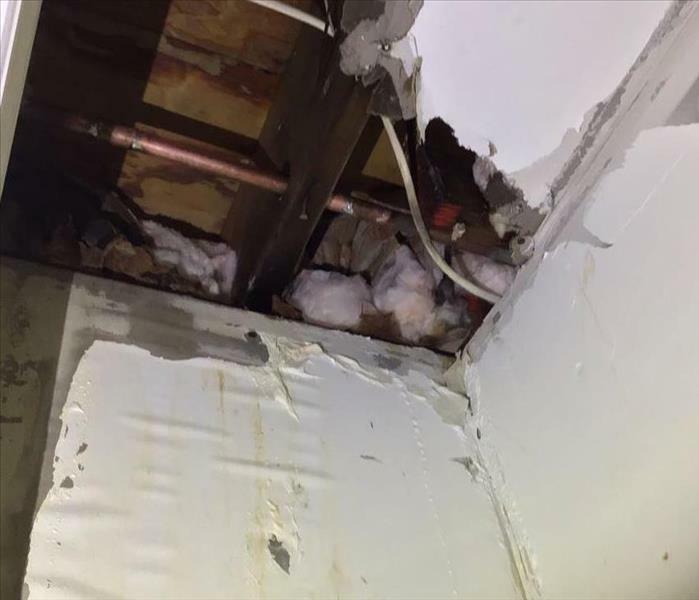 SERVPRO was called to this home in Hillsdale for mold discovered in a bedroom, and discovered mold behind sheet rock in the hallway. 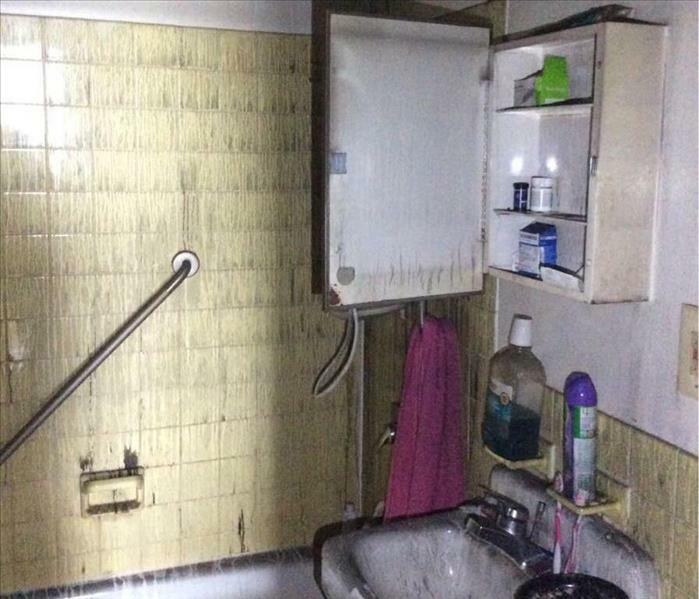 This home was damaged by a fire that left the structure uninhabitable. 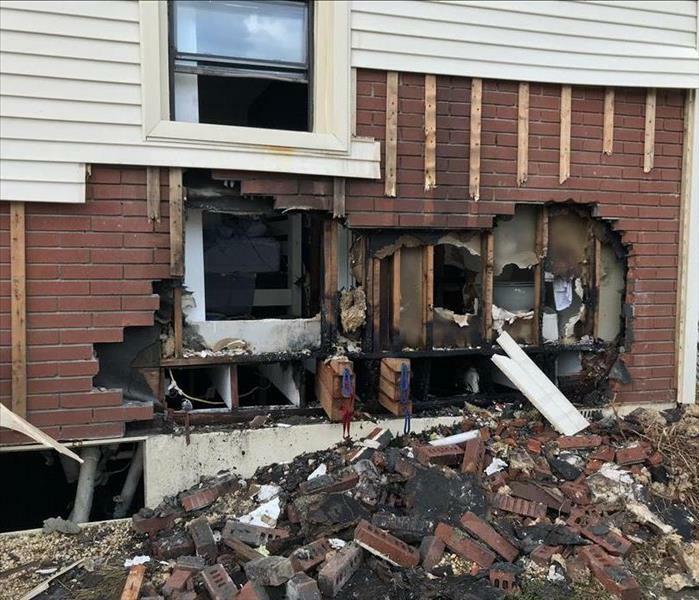 SERVPRO of Hackensack / Little Ferry boarded up the structure, and if possible, will help rebuild and restore the home to its original condition. Sometimes after a significant water loss you can't dry out and salvage everything. Unfortunately this wood floor was too soaked to be able to save, and had to be ripped up. But SERVPRO of Hackensack/Little Ferry knows how to do it the right way. 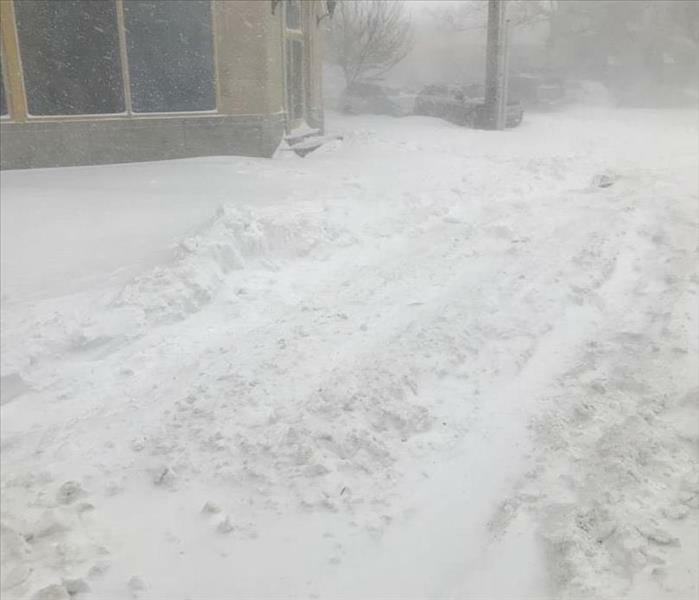 The end of January saw Winter Storm Harper make its way across the country, dropping snow and plunging temperatures from the Midwest to the East Coast. 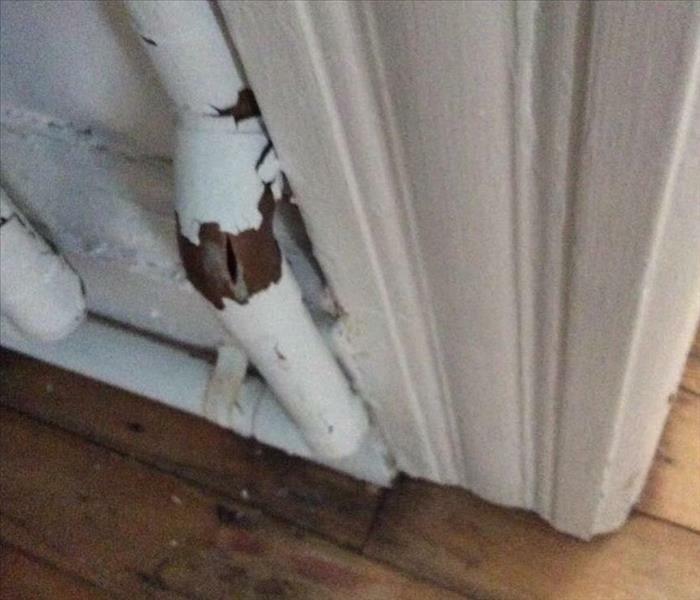 SERVPRO saw many instances of frozen pipes that burst, such as this one in a hall closet in Hasbrouck Heights, that caused water damage throughout the entire house and basement. 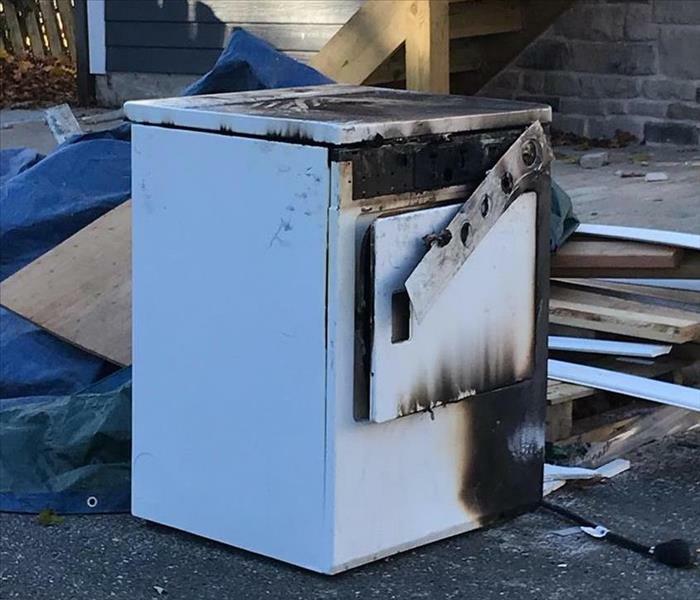 A kitchen fire in a condo unit, though extinguished quickly, still affected the entire unit with residual smoke and ash. It is important to call in professionals to make sure the fire damaged is cleaned correctly and thoroughly. 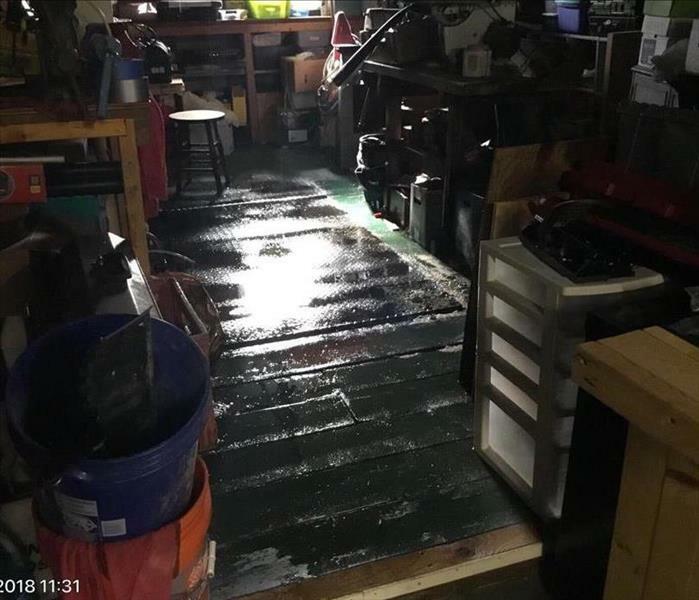 Too much rain in New Jersey this season means that when the ground is saturated, basements get wet. Usually groundwater will seep in through foundations or, in torrential downpours, through windows or cracks. When freezing temperatures hit the Tri State area, make sure this doesn't happen to you! Wrapping pipes, keeping the temperature at least 50 degrees Fahrenheit and leaving door under sinks open while away will help prevent pipes freezing and bursting. Water will always find its way to the lowest point, evidenced by the flood in the basement that started with a leak on the second floor. Unfortunately for this homeowner, that meant water damage to ceilings and floors throughout the entire home. This condo unit caught fire and the fire department needed to break through the wall to put it out. In this case, SERVPRO was able to clean the contents inside the home, and remove smoke and soot issues in the unit above. 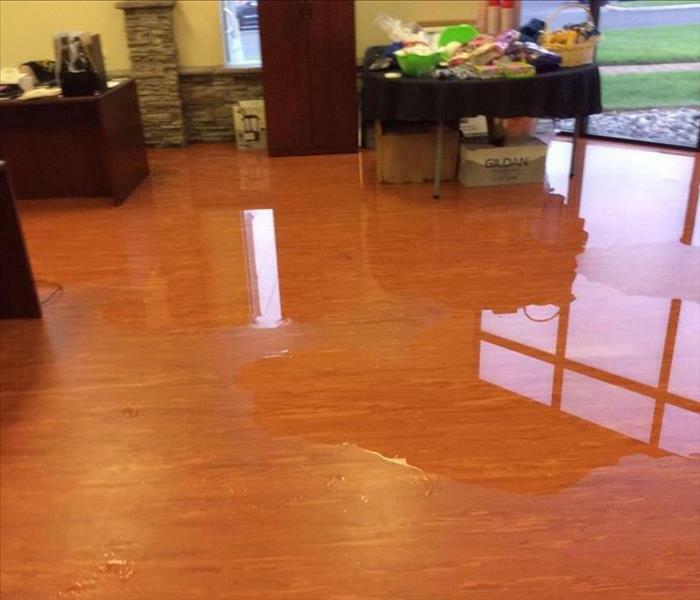 The office space in this industrial park in Bergen County suffered extreme water damage. 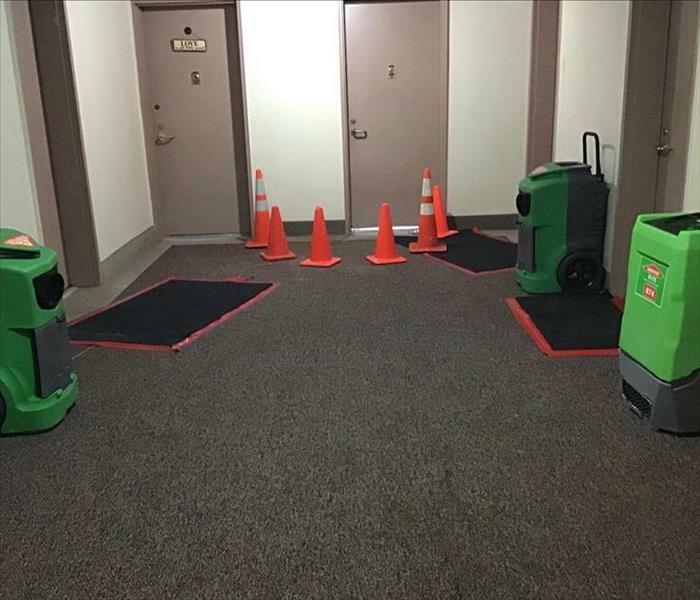 SERVPRO of Hackensack/Little Ferry was called in and extracted the water, and got the office space back in working condition within days. 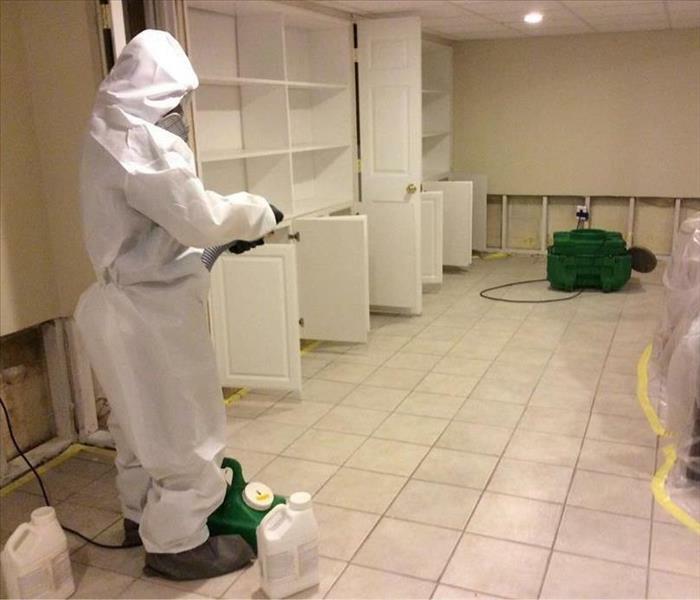 Basements are a breeding ground for mold, and you may not even know you have any. SERVPRO of Hackensack/Little Ferry discovered mold growth in this home after we were called in for water damage. 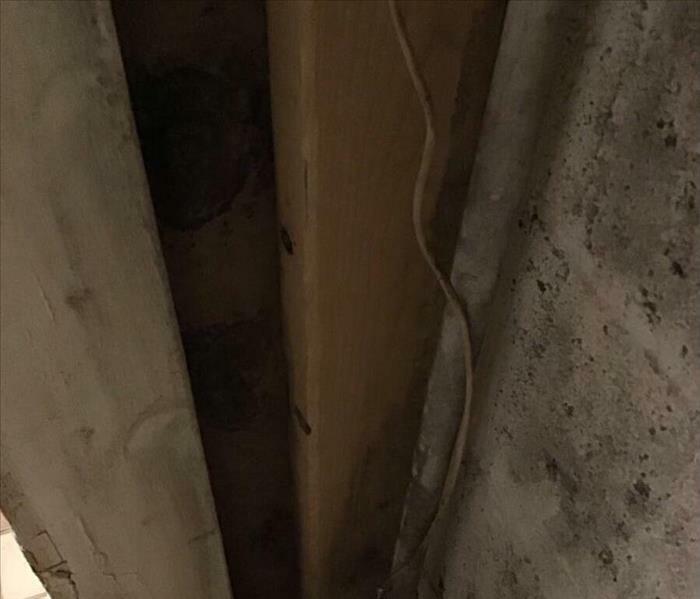 After moving furniture during a water cleanup, mold was discovered in a wall recess. 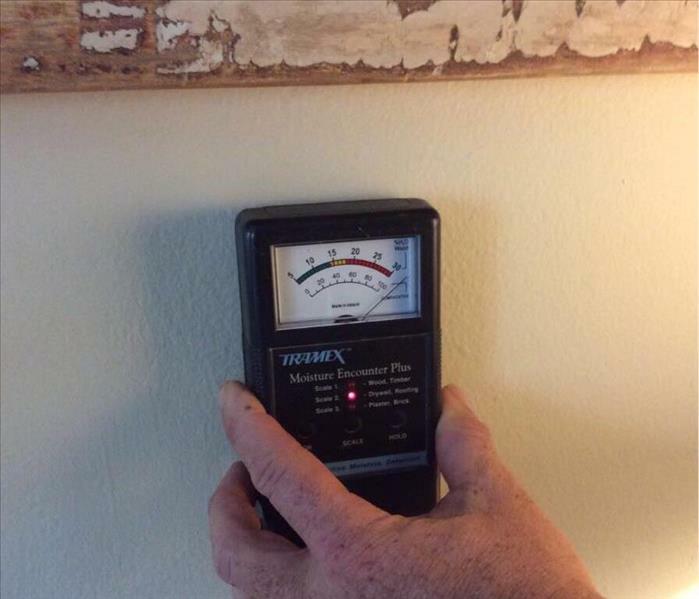 This is common, especially in basements where it can be damp and cold/humid. 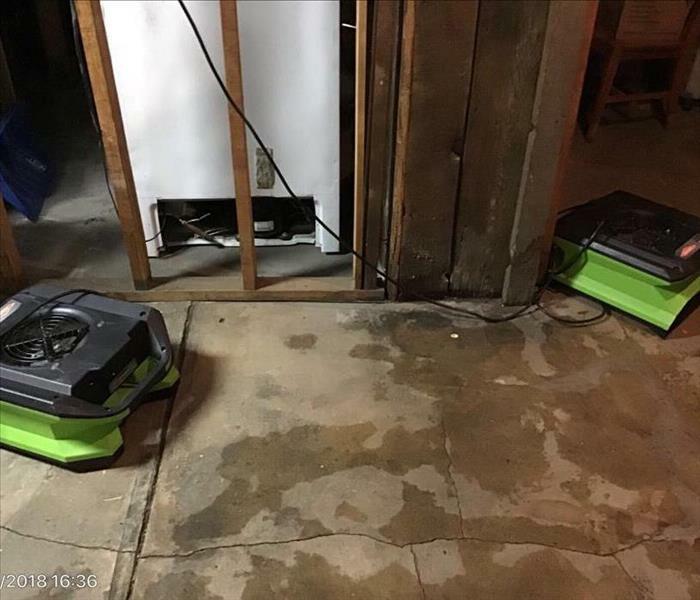 After the water loss, SERVPRO helped the homeowner with mold mitigation. 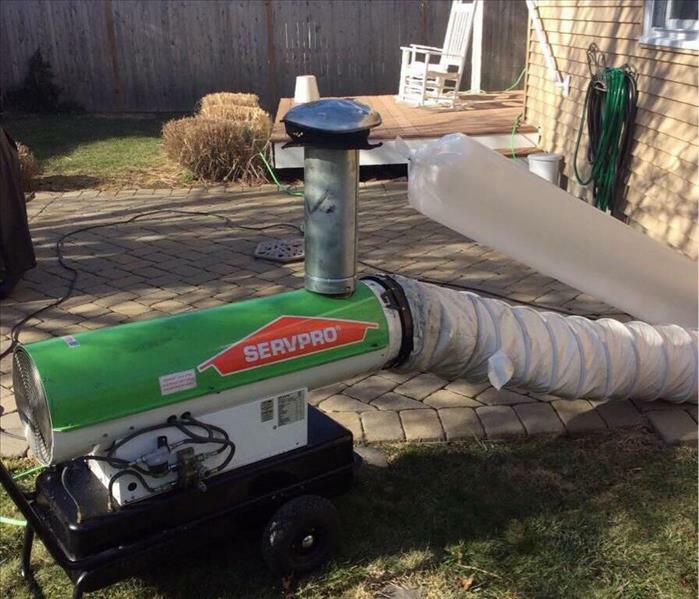 Sewage backup can happen to anyone, but SERVPRO is the premier restoration company proven to be able to handle big loss jobs completely and professionally. We have special equipment which enables us to clean sewage correctly. 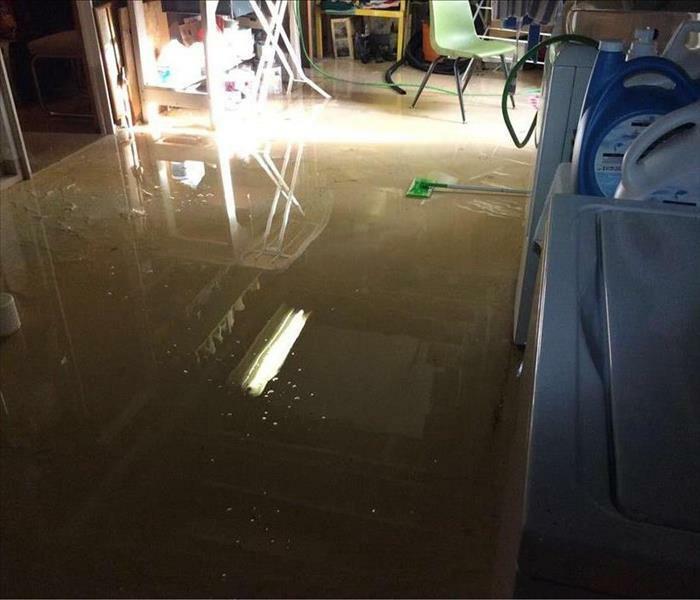 NJ had a lot of rain, resulting in wet basements throughout the area. In this particular home, in order to heat the space and help it dry a diesel powered indirect heater was used to speed up the process. This is the aftermath of a microwave fire. The entire door and glass melted, and there was debris everywhere. SERVPRO of Hackensack/Little Ferry was able to clean up the mess and help the homeowner get his kitchen back to normal. 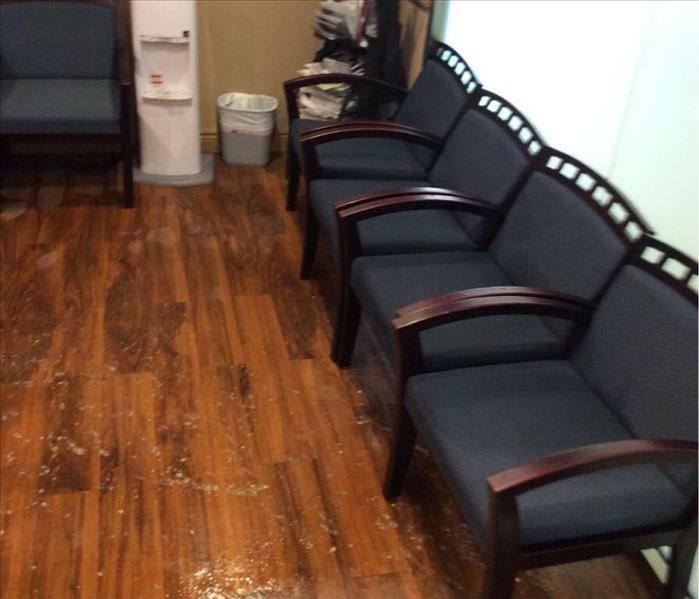 A broken pipe shut down this doctor's office due to a lot of water everywhere, but SERVPRO of Hackensack/Little Ferry was able to clean up the water, dry out the office and get the doctor back in business! Water damage can be devastating for homeowners. Many times water will seep from the floor above and destroy the ceiling / sheet rock below. Calling SERVPRO will insure your home is restored with the utmost care and professionalism. Garages can be a tricky place for mold. Because they are not temperature controlled nor have true ventilation, they are susceptible to extreme temperature changes. 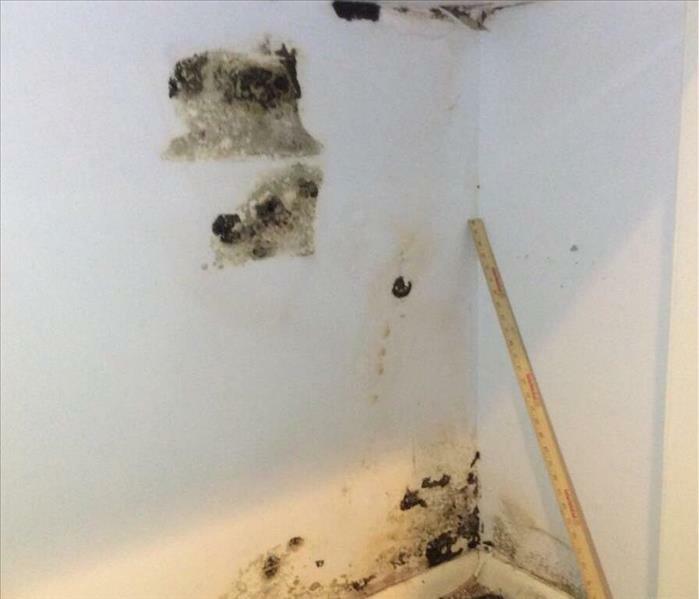 Just a little bit of moisture can result in mold growth. Even when water damage happens on an upper floor, it still needs to go someplace. Gravity usually pulls it down to the lowest level, where it can pool and make a mess. 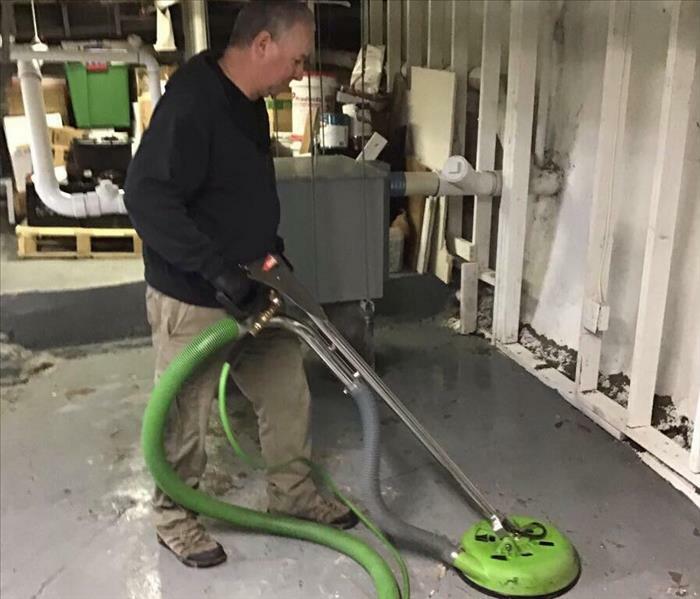 SERVPRO of Hackensack/Little Ferry came in and cleaned up the mess, and made it "Like it never even happened." Winter storms can bring an array of issues from frozen pipes, ice dams to melting snow in your basement. Exposed water pipes should be wrapped and faucets should be turned on to allow a trickle to come through to prevent freezing and pipes bursting. Leaking roofs need to be patched or re-freezing precipitation could widen gaps and bring in more water and cold. Clogged gutters should be cleared to let liquid flow and not get a chance to freeze so gutters weigh down. 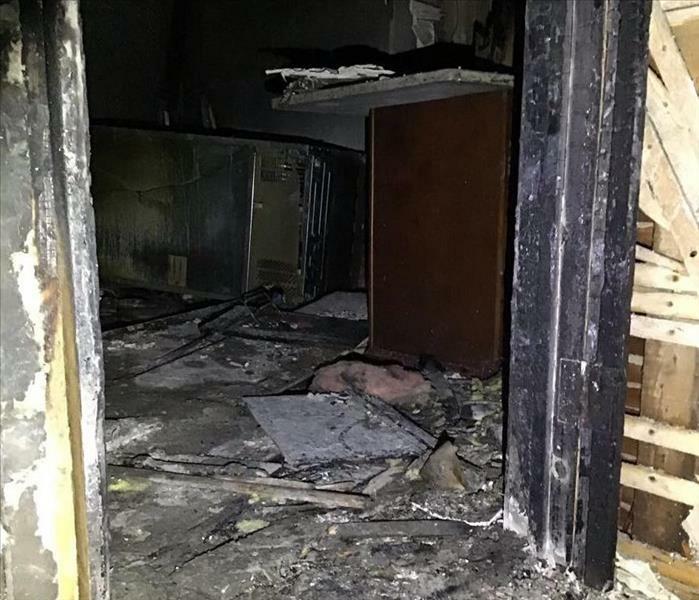 Cleaning after a fire can be particularly tricky, especially since often it is difficult to see where smoke and soot have settled. We have special tools such as this Dry Clean Sponge to make sure your home is cleaned thoroughly. Having the right restoration company after water damages your home makes all the difference in making sure there is no mold or health problems down the road. Done right, hidden moisture behind sheet rock, tile, or flooring is found and either dried or removed properly. It's important to remember cooking safety at all times, especially during holidays. It's easy to get distracted, and the potential for cooking fires is great. 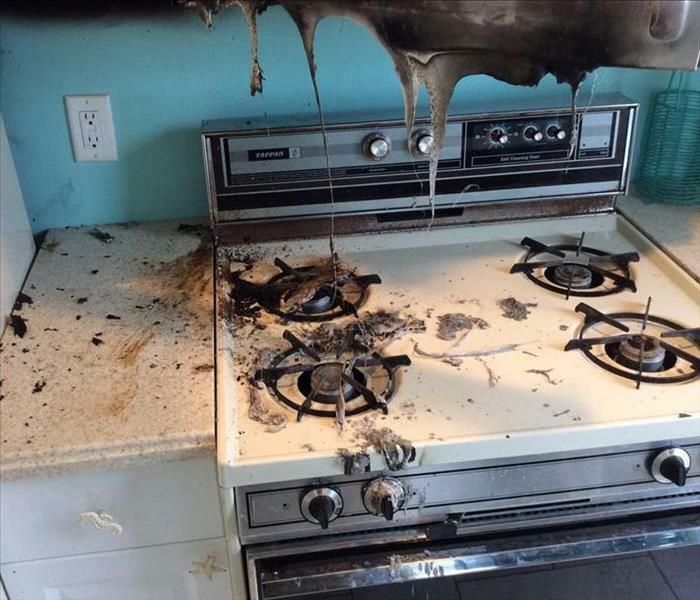 Luckily this stove fire was contained and no damage other than the stove occurred. 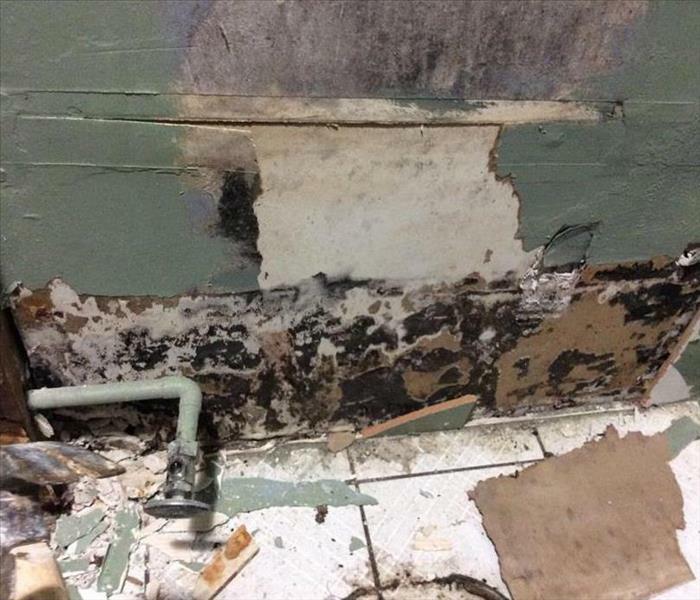 A sewage backup in this house in Maywood, NJ required professional cleanup and restoration. 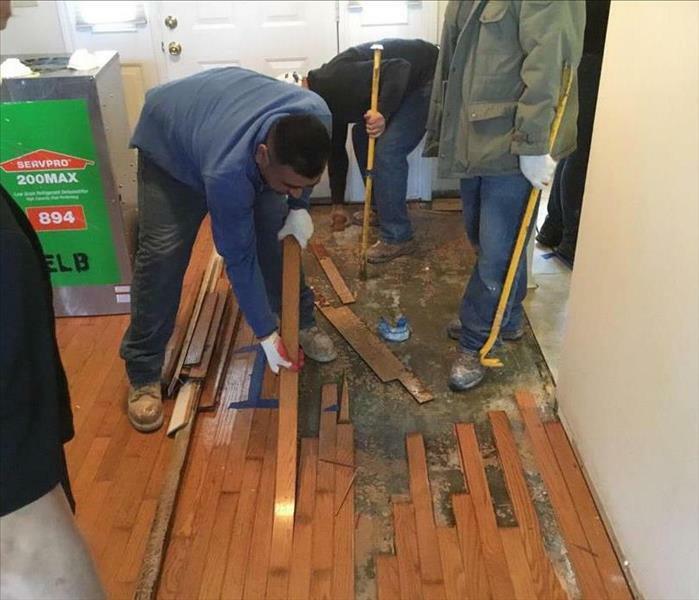 Trying to take care of sewage without professional help can be dangerous - so it is important to call SERVPRO of Hackensack/Little Ferry to make sure that your home and contents are restored properly and safely. The basement of this restaurant in Fort Lee, NJ had a sump pump failure, leaving water in places that needed to be cleaned up. 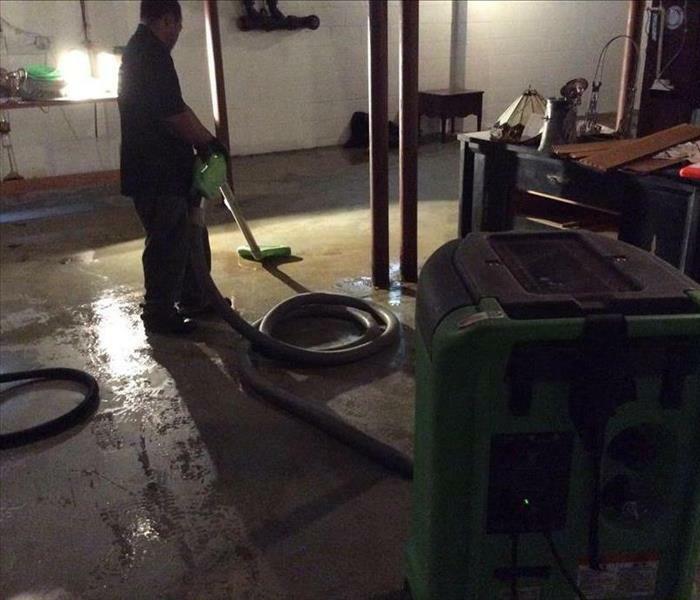 SERVPRO of Hackensack/Little Ferry was called in and took care of the water and dried out the basement. Sometimes we are able to save wood floors by using special equipment to dry underneath laid flooring. We use Injectidry floor drying system, which blows air underneath planks to dry them. 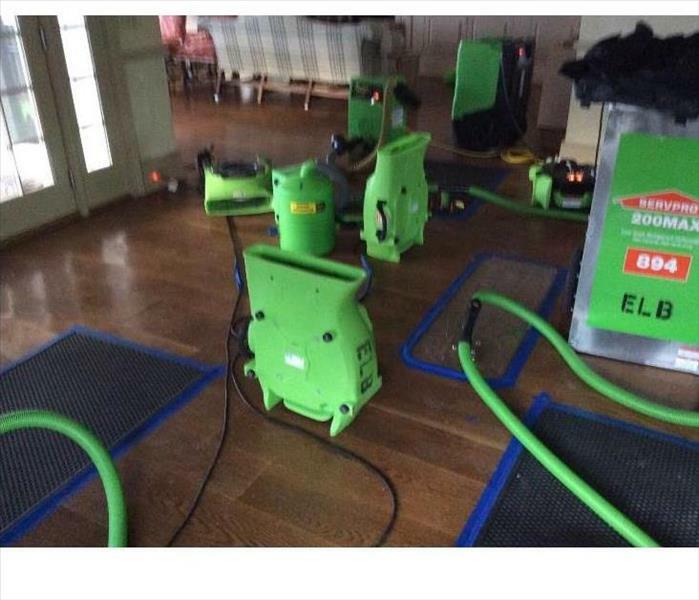 That , in conjunction with air movers, and water damage helps make your water damage "Like it never even happened. 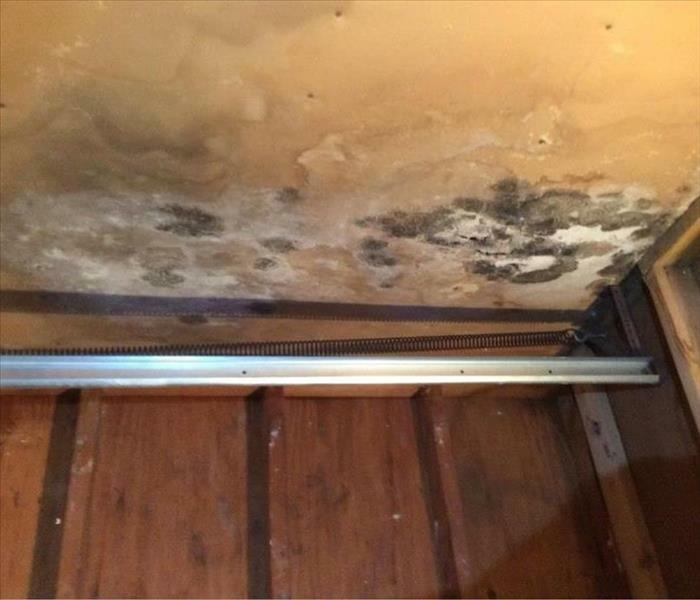 Mold can grow anywhere and in any season if given the right conditions. Once mold finds the perfect environment it will continue to grow and spread unless properly treated. 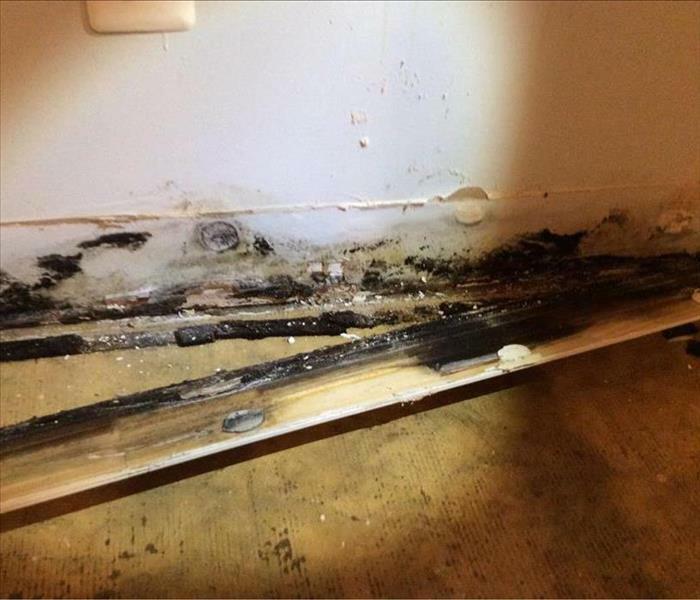 Mold was growing rampant in a bathroom, which was undetected until the sink and vanity were removed.